Manchester City were awarded a controversial penalty against Tottenham this evening, fortunately for Spurs Hugo Lloris saved Sergio Aguero’s spot-kick. Pep Guardiola’s side were awarded a penalty in the 12th minute of the match, the referee stopped the play to consult with VAR after Raheem Sterling’s shot hit the hand of Spurs left-back Danny Rose. The penalty incident could be likened to that of Presnel Kimpembe’s against Manchester United, Rose’s use of his hands certainly didn’t seem intentional – but UEFA’s new rules mean incidents like this will now result in a penalty. 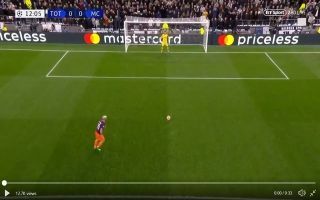 Hugo Lloris saves Sergio Aguero's spot-kick after VAR awarded Man City a penalty ? Lloris’ save was absolutely brilliant, the Frenchman has definitely made up for his costly mistake against Liverpool recently. Fans could call for the rules to be changed – in scenarios like today’s it seems very unreasonable to award a penalty for a handball during a moment in which a player can barely control their arms.